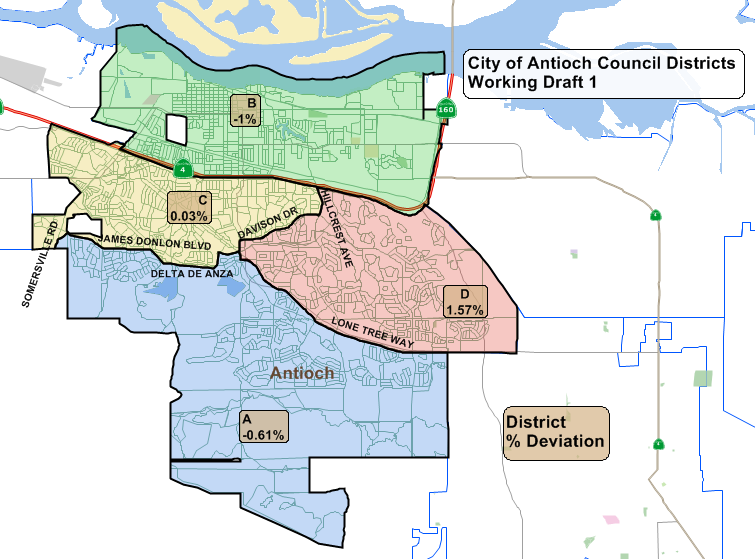 After two-and-a-half hours of hearing vary disparate comments from the public, and a lively debate and discussion by council members, the Antioch City Council voted to narrow down the number of draft maps for the council district elections from four two to. The two final maps, referred to as Working Draft I and Quadrants B offer very different options and the public comments reflected those differences. Some speakers still advocated against changing to district elections, saying it will divide the city and cause council members to compete for tax dollars for projects just in their districts. The Working Draft I map creates a single district on the north side of Highway 4 and that was supported by most of the speakers, many of whom live in that area of the city. The arguments were that there hasn’t been an elected city council member from the north side of the freeway since the 1980’s and the people there want someone who lives in that part of town to represent them. It was pointed out that appointed Council Member Martha Parsons lives in the north part of town and served on the council in the last decade. However, she was not elected when she ran at the end of her appointed term. Most of the speakers in favor of Working Draft I were Hispanic, members of the East County Regional Group, and live in that part of the city, two of whom spoke in Spanish and used a translator. Another speaker in favor of the Working Draft I map was former Antioch School Board Member Joy Motts, who lost for re-election in 2014 and lost for election in 2016 and is the only candidate for city council who has filed paperwork declaring her intention to run this November. That map garnered the support of Mayor Pro Tem Lamar Thorpe and Councilwoman Monica Wilson. Thorpe only wanted to advance that map for a final vote at the council meeting on April 10th. He argued that Motts couldn’t get re-elected because people on the south side wouldn’t vote for her and viewed her “as old Antioch and dismiss her.” Wilson echoed Thorpe’s comments, giving what sounded like an endorsement of Motts’ candidacy. However, Mayor Sean Wright pointed out that Antioch School Board Member Diane Gibson-Gray lives on the north side of town and was able to get elected. 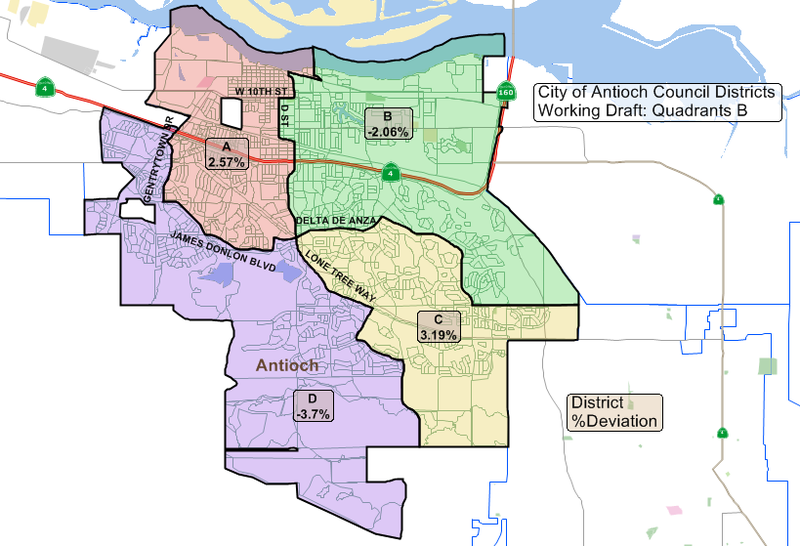 The Quadrants B map had the apparent support of Wright, and Councilmembers Lori Ogorchock and Tony Tiscareno, who agreed with the public speakers in support of it, that it would allow two council members to represent portions of the north side of Antioch. The speakers in favor of that map, including former Antioch Mayor Don Freitas, argued that in order to get something accomplished it takes the votes of three council members and with two representing the north side of town, that area will have more advocates on the council, making it easier to get to three votes. However, there was an effort at the end of the hearing by Wright to make some changes to the Quadrants B map, to accommodate some of the concerns expressed by members of the public. As the hour was getting late, the consultants said any change to one district would cause a ripple effect among the other districts from a population standpoint, and there were still three items on the agenda that staff said needed to be dealt with, it was decided to hold one more workshop, prior to the April 10th council meeting, at 5:30 p.m. that same evening. Interim City Attorney Derek Cole explained to the council that they have three things to decide at their meeting on April 10. First, they must vote whether or not to move forward with district elections, and if so which map to use and when to implement them, either this year, or wait until 2020 to do so. The council voted unanimously to support moving forward both maps. They also agreed to hold a special meeting on Monday, April 23 to accommodate Ogorchock’s schedule, as she will be out of town on April 24, and to ensure they complete the process in the legally proscribed time frame to avoid facing the threatened lawsuit, which started the entire process, in court. Former Antioch Councilwoman Norma Hernandez was the first member of the public to speak saying, “I can’t believe this is the United States of America and this is happening in the City of Antioch. This is the worst thing that could happen to our city. “We’re putting people against each other. At the same time, we’re disenfranchising the voter. They can only vote for the mayor and one member. They’ll only have two people beholding to them. I can’t believe this man who has come to our cities and is going to other cities is getting away with this. Tina Price said “I am here for the Change.org petition, put together with Ms. Walker,” referring to designating the Hillcrest/Deer Valley corridor as a community of interest. She then read from the petition, which can be seen at the link, above. Verlyn Leon said, “A resident of Antioch for more than 15 years. I greatly value having a democratic process and I support creating a single district north of Highway 4. Has different needs than other parts of Antioch. An accessible representative. Someone who lives our realities. That is democracy and is how you make our city strong. If you divide north Antioch it will create more inequality…we run the risk of being a minority. It is fair, it is democratic and the right thing to do. East County Regional Group Vice Chair Freddie Leon said he and his wife were celebrating their 19th anniversary, which garnered applause from the audience. “This is more important,” he said. “I have lived in Antioch for more than 15 years. I want my city to be a safe and secure place to raise my kids. Many people living north of Highway 4 are immigrants and people of color. The community is strong. They go to church and try to improve the community. I know it’s a really hard task but they are trying. North of Antioch above Highway 4 needs to be one entity. I support working Draft 1. It is the only one that is fair. Dr. Terry Ramus said, “Our family has lived here for 33 years, in our current house for 28 years. I was at the mapping meeting…I am opposed to this entire process. My caution is that sometimes you might get what you wish for. Folks are saying keep all of the area north of Highway 4 in one district. But, you have one vote. You still have to get two more votes. I have been coming here for years” speaking for things in the north side of the freeway. Former Mayor Don Freitas said, “Well I’m 63 years of age and I was born in the city of Antioch. I was born in the hospital on 6th Street. I also had the great fortune of representing Antioch both locally and regionally. A lot of people, you’re always going to think of Antioch’s best interests. I absolutely hate this districting plan is being shoved down the throats of the people of Antioch. You can fight it or we can create four different districts. The decision you make is going to last forever. It’s critical for every decision for each census when we have to move the lines. Two things are critical. Shape and balance. “I absolutely do not like this alternative (Working Draft I). Politically you will isolate the downtown area. Be careful what you ask for you might get. You might have a representative in this schematic. “Quadrant B…in this case you will have potentially two representatives. “I strongly encourage you start in 2020. Alternative one does not provide balance. It does allow one person to rant and rave about the needs of the downtown area. Joy Motts was the last to speak saying, “I was also born on Sixth Street in the same hospital (as Freitas). I couldn’t disagree with you more. We already have the situation of have and have nots. Although this isn’t a panacea. Clearly the people of the community are speaking out saying they want to keep the north part of Antioch together. I agree. One of the reasons I ran for school board was because…Antioch High School was falling apart. I lived in north Antioch…I knew the needs there. It’s only because I brought that forward…we brought it before the people and they supported it. I’m just saying this is going to work. I have trust in you. We’re all adults. We’re one community, one Antioch. But we need representation for those communities. Your Quadrant map literally divides the (Rivertown) Preservation Group. Keep north Antioch together. It won’t divide this community. It will empower this community.” (Editor’s Note: The Quadrant B map does not divide Rivertown, which is bordered from 10th Street north to the river. The section divided by that map is south of W. 10th Street). Mayor Pro Thorpe was next to speak saying, “This is a big issue and you know Antioch has gone through a lot of change. There’s a lot of change happening very rapidly. I don’t like this process. This should have gone to the voters. But, as I’ve maintained throughout this process…I have a difficult time with these quadrants. I’m not a big fan of them. Population…I go beyond that and look at voting patterns. The quadrants do a disservice. There are just some claims that are made that are not accurate. It is true the last person to be elected to the Antioch Council was in the 1980’s. But the last person to serve was Martha Parsons. That will be the same. Because southeast Antioch has grown. I wish Joy Motts was still on the school board. But, she’ll never get elected because people in south Antioch look at her as old Antioch and dismiss her. This is not dividing up the city but creating legislative districts. Some folks made some claims there will be some infighting and back room deals. I picked up the phone and called Berkeley…and they said the divisions of…the hills and the flatlands have always been there. The same for Elk Grove. “You find there is infighting but it’s because of personalities not because of districts. For anyone to call this a special interest…this is a community advocacy group. The special interests are the ones financing our campaigns…who focus on growth in southeast Antioch. Because that’s how you get elected in Antioch. It’s through single member districts that you can raise enough money from your neighbors…so you don’t have to hitch a ride with developers, Realtors or unions. I’m not supporting any of the quadrants because they don’t fulfill the purpose. Clark then switched over to a live map to draw changes. Cole said the council could hold another workshop. The council then decided to start the workshop at 5:30 p.m. following a closed session at 5:00 p.m. on April 10th. The council then settled on a special meeting on Monday night, April 23rd. On April 10th 5:30 p.m. the council will have a workshop on the final map. At the 7:00 p.m. meeting they will take initial votes on the matter. On April 23rd the council will consider the adoption of the final map. This entry was posted on Wednesday, March 28th, 2018 at 10:53 pm and is filed under News, Politics & Elections. You can follow any responses to this entry through the RSS 2.0 feed. You can leave a response, or trackback from your own site.